Why is he called Foghorn Leghorn? Who are some of those other characters with Foghorn? When were the Foghorn Leghorn cartoons made? Were any Foghorn Leghorn cartoons nominated for academy awards? What was the best Foghorn Leghorn cartoon? In which cartoon did _____ happen? 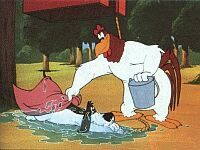 Where can I find Foghorn Leghorn cartoons / videos / merchandise? What is that song Foghorn likes so much ("Doo dah, doo dah")? Does Foghorn ever sing anything else? Where did Foghorn Leghorn go to college? Who are the hens who tease Miss Prissy? How about some Foghorn Leghorn quotes? Foghorn Leghorn is voiced by Mel Blanc and was created by Robert McKimson, who also directed all of the Foghorn cartoons. McKimson is also known as the person responsible for creating most of Foghorn's supporting cast as well as many other Looney Tunes characters including Tasmanian Devil, Hippety Hopper, Sylvester Jr., and Speedy Gonzales. His cartoons are often recognizable from their fast action sequences such as the lightning fast whacking of Dawg's behind by Foggy or the spinning of Taz (or weasel). See the site Remembering Robert McKimson for some more details on this underappreciated Looney Tunes director. I've heard several reasons offered, and believe that all of these may be valid. (1) There is a variety of chicken called a Leghorn. (2) He's a loud-mouthed rooster, and a foghorn is known for its booming volume. (3) Foghorn and Leghorn sound good together. (4) His character is at least partially based on Senator Claghorn, from the Fred Allen radio show in the 1940s (played by Kenny Delmar). Note the similarity between the names Foghorn, Leghorn and Claghorn. To listen to some samples of this character (taken from actual radio broadcasts) select one of the items available here at Earthstation1 and note the similarity to Foghorn Leghorn. Where does Foghorn Leghorn live? Some assume that he must be from the south - because of his southern mannerisms and such, but in reality he appears to move around. 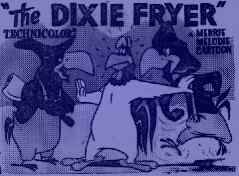 For example, his address is Cucamonga, California on a telegram from Rhode Island Red, however in Dixie Fryer he flies to south of the "Masie-Dixie line" to get "out of the deep freeze and into the deep south" indicating he is from the northern half of the US, and not Cucamonga. In at least one other cartoon he talks about going south to get warm, and in yet another Weasel While You Work he seems at home in winter weather. And of course, he is driven to woo Miss Prissy in order to get into her warm henhouse before winter arrives in both Strangled Eggs and Little Boy Boo. So in conclusion, while he may have been born and raised in the south, he seems to move around during the various cartoons. Henery Hawk - a young chickenhawk who usually is seen looking for a chicken to eat, but doesn't know what a chicken looks like. 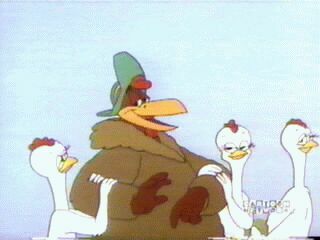 Henery's career actually predates the Foghorn Leghorn cartoons with the 1942 cartoon The Squawkin' Hawk. What's more, Foghorn's career began as a supporting role for Henery in Walky, Talky Hawky. Due to the popularity of the rooster, Foghorn was kept as a lead character of his own. 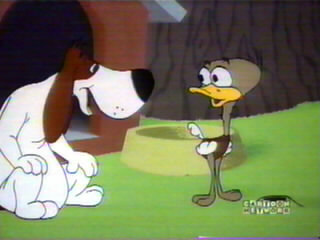 Mel Blanc supplied the voice for Henery. Barnyard Dawg - the guard dog for the barnyard who usually spends a good portion of the cartoon at either the giving or receiving end of a practical joke involving Foghorn. Although his job is to protect the chickens, he frequently takes an active role enabling Foghorn's pursuers to catch him. Mel Blanc supplied the voice for Dawg. There is some confusion and debate about the name of this character. For one thing, Foghorn never calls him by any name other than "Dawg" or "B'rer Dawg". His first Foghorn cartoon appearance was in the first one, Walky Talky Hawky in 1946, but the next year he appeared as "Mandrake" in the cartoon One Meat Brawl (which featured Porky Pig and Grover Groundhog). He appeared also as Elmer's dog (called Rover) in Don't Axe Me (1958). There are model sheets which list his name as either "Barnyard Dawg", "Barnyard Dog" or "Dawg". And finally, he was called George P. Dog during appearances on the Bugs Bunny Show. Miss Prissy - a spinster hen with (usually) a limited vocabulary who is sometimes after Foghorn for her husband (e.g. Lovelorn Leghorn), and other times Foghorn woos her to get into her warm henhouse for the winter (e.g. Strangled Eggs, Little Boy Boo). Miss Prissy's voice is not always the same - her voice was most often supplied by Bea Benaderet, but was voiced by June Foray in A Broken Leghorn, Julie Bennett or June Foray in Strangled Eggs (I'm not certain which one) and by Nancy Wible in The Yolk's on You. 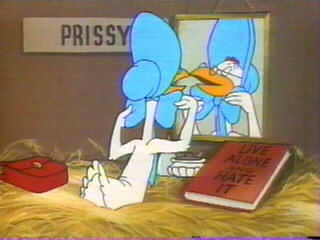 Some believe that the Miss Prissy character was inspired by another lovesick chicken named Emily who had appeared in three earlier WB cartoons. Egghead Jr. - the silent son of Miss Prissy and the brainiest chicken in the yard. The identity of the youngster's dad is never revealed, but is presumably a rooster named Egghead (after all, he is called "Egghead Junior"). It is firmly established that he is not Foghorn's son. Foghorn often finds himself trying to teach him the bespeckled lad something only to have Egghead Jr. devise an incredible solution. Weasel (unnamed) - a hyperactive rascal who wonders into the chickenyard when hungry. He is a bit like the Tazmanian Devil character, even making a Taz-like spinning sound when trying to chew on Foggy's leg. But poor weasel is less formidible than Taz, primarily due to his size. He has even less of a vocabulary than Taz, consisting primarily of slurping, panting, and the occasional high-speed "yeah yeah yeah". Taz and Weasel were both created by the same person, Robert McKimson, with the "little lint-pickin' weasel" appearing first. So Weasel was almost certainly a major inspiration for the little Devil. I've seen claims that some time after the last Foghorn cartoon was made, Warner Bros. gave him the name of "Willie Weasel" but I haven't seen this confirmed by an official source. 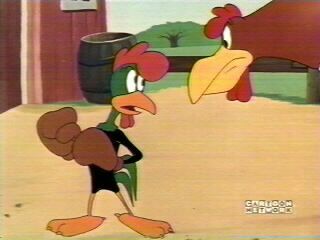 Pappy and Elvis - a father and son combo who are called chickenhawks in Dixie Fryer but who appeared as buzzards a year earlier when opposite Bugs Bunny in another McKimson cartoon, Backwoods Bunny. The two were voiced by Daws Butler. Rhode Island Red - Foghorn Leghorn's old college chum who drops by unexpectedly in Raw! Raw! Rooster!. Red was voiced by Daws Butler. There are some clips from Red on the sounds page, including Here's Red! (unnamed) Barnyard Cat - a black and white cat (no red nose like Sylvester) who appears with Foggy in A Fractured Leghorn (1950) and Leghorn Swoggled (1951) (and without Foggy in It's Hummer Time). He is probably remembered best for his role in the first of these as the cat who fights with Foggy over a worm and only has one line in the cartoon. 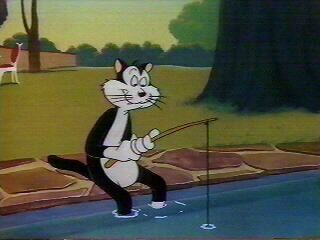 I have seen some cartoon fans refer to this cat as "McKimson's cat". Kid Banty - a banty rooster who appeared in Sock A Doodle Doo. He was introduced as the "pinfeather weight boxing champion". Anytime the little guy hears a bell, he comes out punching at whoever is nearby. The first Foghorn Leghorn cartoon was Walky Talky Hawky in 1946. The final one was in 1963 and was called Banty Raids. 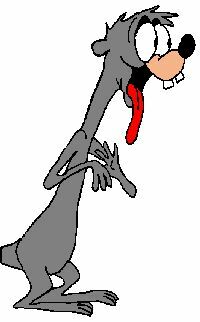 He had a brief cameo with one line of dialog in the final Warner Brothers studio cartoon, False Hare (1964) which starred Bugs Bunny. Foghorn has had small roles in some other films including Bugs Bunny's Christmas Carol (1979) and The Yolks on You (1980). He was also on the Looney Tunes squad in the feature film, Space Jam and in a cartoon called Pullet Surprise. Only one - his debut: Walky Talky Hawky (1946). It lost to the Tom and Jerry cartoon The Cat Concerto. This is a difficult question to answer since opinions vary so much, and it's hard to narrow down but I'll list a few I consider among the best, but not in any particular order. Walky Talky Hawky (Academy Award nominee, introduced many of the best-loved elements including Henery not knowing what a chicken looks like and Foggy and Dawg pulling pranks on each other). Little Boy Boo (Foghorn has to match wits with little Egghead Jr., but he doesn't stand a chance against the brainy bird). Lovelorn Leghorn (Miss Prissy's casaba dance is one great moment out of many in this cartoon where two common plotlines combine; Foggy trying to harass the Dawg, and Prissy wanting a husband). Of Rice and Hen (Another great husband-hunting cartoon). 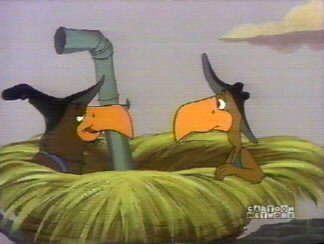 Mother Was a Rooster (The ostrich is a great one-time character in this cartoon in which Dawg has an especially strong performance). If you want to figure out which cartoon had a certain event or plotline, there are a couple of places to try. You can try the the Filmography page here at One Foggy Site. If this isn't enough then I'd recommend the book Looney Tunes and Merrie Melodies: A Complete Illustrated Guide to the Warner Bros. Cartoons by Jerry Beck and Will Friedwald . This is a great reference guide for any Looney Tunes fan, with hundreds of pictures and detailed summaries of every cartoon. It's stocked at most major bookstore chains and is available from any online bookseller as well. UPDATE! : I've set up a new page with info on finding Foghorn stuff! ----- Click here to see the new page with video / merchandise info! The only place to catch Foghorn Leghorn on TV in the USA is presently Cartoon Network. Note that they mix the Foghorn cartoons in with others and they do not announce in advance what cartoons will be broadcast on a given show. There are four shows on CN which carry Foghorn in their rotation: The Looney Tunes Show, The Bugs and Daffy Show, The Acme Hour and (sometimes) Toon Heads. As they say in the business, "see your local listings for the time and channel" of these shows. One last note about Foggy on CN - there were special events a few times in the past in which they showed a 3 hour "superchunk" of Foghorn Leghorn cartoons. However CN hasn't been doing these lately so you can't expect to see one of these anytime soon. However, anytime I hear about an upcoming Foghorn "superchunk" I'll put a notice on the site home page! FWIW, here is more info about past superchunks. The alternative to TV is to obtain videos. Unfortunately, there was only one video ever made which featured several Foghorn cartoons together - "Foghorn's Fractured Funnies" and it has been out of print for several years. (It does appear on eBay and other online auctions from time to time). Therefore it is very difficult to locate and is overpriced if you do find it. I'm hoping WB gets wise and rolls out more Foghorn videos in the future, but at present they seem focused on pushing a certain few "top" characters. Here's an example of Foghorn singing it. It's called Gwine to Run All Night, or De Camptown Races and was first published almost 150 years ago (1850) by Stephen C. Foster. Here's a link to the lyrics. Of course Foghorn Leghorn wasn't above inventing his own lyrics for it (e.g. 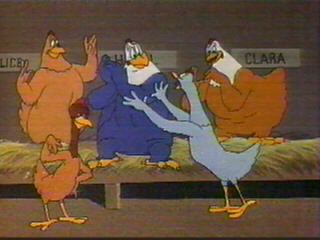 the opening scene in Dixie Chicken). Anyway, Stephen Foster is famous for many other songs, several of which appear frequently in Looney Tunes cartoons as incidental music. A few of his most well known compositions include Oh! Susanna, My Old Kentucky Home, Jeanie With the Light Brown Hair, Beautiful Dreamer and Old Folks at Home (a.k.a. Way Down Upon the Swanee River). Although he was a notherner who only visited the south once in his life, his songs were often about the south and became incredibly popular there. You can learn more about this facinating man at the Stephen Foster Home Pages, at the Center for American Music or by looking for more info on him on your search engine of choice. Oh Doggie (unnamed song from Of Rice and Hen) Click here to listen to the song. According to the cartoon Raw! Raw! Rooster!, Foghorn and his chum Rhode Island Red went to Chicken Tech. However, it's interesting to note that during the title sequence for this cartoon Red is shown holding a college pennant with the letters PU on it. Anybody think it could be for a Poultry U? It was more likely just a "PU" joke. Now of course there was a PU (Pimento University) featured in the Warner Bros. cartoon The Dover Boys (1942) but there is probably no connection. In some cases they are never identified but according to the cartoon Lovelorn Leghorn, some of their names are: Clara (all white), Hazel (white head, blue body), Alice (red head, brown body), Pauline (all brown) and Mae (white head, brown body). Here's a group picture. Where do you start? Foghorn Leghorn was known for having witty responses in key moments, and often these were directed at the audience rather than another character. Bugs Bunny is probably the only Looney Tunes character with more of these. Anyway, here is a sampling which is sure to grow. Some are linked to wave files of the quote. Be sure to visit the One Foggy Site SOUNDS page for some other quips which are not listed here. Clunk enough people and we'll have a nation of lumpheads. She reminds me of Paul Revere's ride - a little light in the belfry. Gal reminds me of the highway between Ft. Worth and Dallas - no curves. As bare as a cooch dancer's midriff. Hey boy, you cover about as much as a flapper's skirt in a high wind. She's tryin' to make a pantywaist out of that poor kid. That kid's about as sharp as a pound of wet liver. If kid don't stop talkin' so much he'll get his tongue sunburned. That dog's as subtle as a hand grenade in a barrrel of oat meal. That boy's as strong as an ox, and just about as smart. You're doing a lot of choppin', but no chips are flyin'. The boy's about as sharp as a bowling ball. I've got this boy as figgity as a bubble dancer with a slow leak. I-I-I know what you're gonna say son. When two halves is gone there's nuthin' left - and you're right. 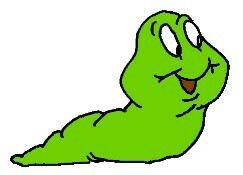 It's a little ol' worm who wasn't there. Two nuthins is nuthin'. That's mathematics son. You can argue with me but you can't argue with figures. Two half nuthins is a whole nuthin'. So, did you learn anything here today? Is there something else you think should be included? Did I get a fact wrong? Whatever is may be, your feedback is welcome - use the FEEDBACK button to sign my guestbook or email me.